KeyBank Live at Larkin 2017 Wednesday concert series announced! 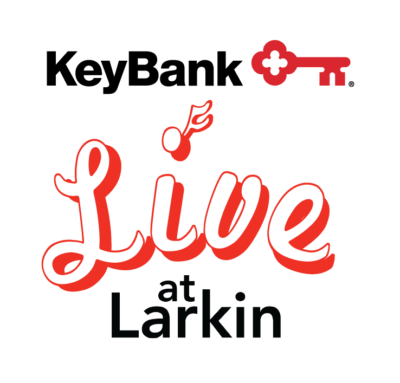 We are pleased to announce the line-up for Larkin Square’s original flagship event, KeyBank Live at Larkin Wednesday concert series. Attracting thousands each week throughout the summer with a wide range of sounds that showcases the diversity of the local music scene. Plus, of course, a selection of food trucks and beverages to boot. Concerts are from 5:00 PM – 8:30 PM. Returning for a sixth season beginning June 7th KeyBank Live at Larkin will welcome a 30-band combination of established local acts, young up-and-comers, both new and returning theme nights, and as usual, a few homecomings and reunions. The 14-week series is bookended by reunions, as Opening Night features reunited reggae ensemble One World Tribe with upstart soul group Empress & the Royals, and the finale again reunites blues-soul powerhouse Dive House Union along with blues legend Jony James Band. 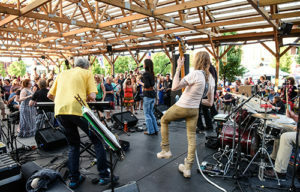 Weeks in between include new theme nights Blues 4 Vets, Grateful Dead Cornell ‘77 Revisited, Colored Musicians Club Centennial, Viva Elvis and Music is Art Festival Preview, along with returning favorites Latin at Larkin and South Buffalo Night. The remaining lineup offers the traditional two-band feature; all concerts will conclude with the continued Larkin tradition of a collaboration between bands. Full lineup below. We’re excited for our sixth season of KeyBank Live at Larkin, which has for us been a perfect way to spend a summer night in Buffalo. While Tuesdays are more a food truck event with live music, Wednesdays are more a live music concert with food trucks. We appreciate the support of KeyBank and Independent Health that allows free admission and parking for all these events.